One of the highlights of this trip is travelling into the outskirt villages outside Ipoh. I used to spend my childhood at the Chinese villages around the tin mine lakes of Balakong. Such trips brought back long forgotten memories. I remember the days of running around wooden houses with worn down cement floors. I also remember once that I picked up a vintage one cent coin on the floor. Video rental shop. Now a sunset business. In Tanjung Tualang town, there are numerous seafood restaurants – all boasting to have the best prawns. My Dad told me that the seafood restaurants have been around since he was my age! One of the most well known restaurants is Luen Foong Seafood Restaurant. Luen Foong consists of two separate shops. It used to be one until it caught fire last year. They are now rebuilding it into 3 storeys building. We were told that it will be ready by next Chinese New Year. We ordered their famous steamed drunken prawns. The mid sized prawns arrived very quickly. It was fresh and sweet. The tender prawn meat was fragrant with Chinese wine. We were told that large prawns are not recommended. We also ordered chiew pai taufu, assam sotong, cheung ching fei chau yu. I would recommend these dishes. The prawns were not cheap. It costs us RM150 for 8. That explains why they could build a 3 storeys building from scratch! After dinner, it was time to head home. Our GPS guided us to KL using trunk roads. We had to find a way back to the North South highway. Unfortunately, the highway was jam. So jam that the emergency lanes were open to the public. We arrived home at 10pm – tired and sticky. It was a great trip in any event. Great times and great company! When I was younger, I always look forward to the New Years Eve parties. Back then, it was all about the music, fireworks and the people. But these parties slowed down tremendously. Last year, I was in Port Dickson and was nicely tucked in bed at 1230AM. But this year, it’s going to be the music, fireworks and the people again! And it’s all happening at MYSTICAL EVE 2012! For the very first time in Malaysia, the ENCORP Strand building will move, transform, and come to life in 3D to the beat of pulsating music, light effects and fireworks. Beams of laser light are hand-manipulated before your very eyes, bent, stretched and spun around like a light sabre by the electrifying Laser Man. With aerialists twirling through space to a dreamy rhythm and a contortionist pushing the limits of human flexibility, the crowds will pour in – mystified! Expect a stellar line-up of local celebrities too, including Joe Flizzow, Mizz Nina, Najwa, Pop Shuvit, Reza Salleh, Shawn Lee Beatbox + Dennis Lau. Not to mention famous DJ acts Aurology, Davern & Jee Hoe, and DJ Xu, pumping up the Red Carpet Avenue with unstoppable energy. Don’t worry about having to clamor for tickets, cos admission is FREE! Grandpa passed away on 4.12.2011 at the age of 103. Towards the end of his life, he wasn’t best of health. I visited him in the hospital before his passing. At such an old age, Grandpa’s mind is no longer there thus making conversation impossible with him. It is unfortunate that I never had a proper conversation with him. Everything I knew about him was through my parents or relatives. This grand old man came from China at a very young age before the Second World War. He worked at a security guard in the beginning of his life in Malaya. But soon he realised that being the first in the workplace and last to leave wasn’t worth it. He then embraced entrepreneurship and started a noodles stall by the name Foong Kwong Kee (馮廣記) – which exists till to date. His first stall was in the old Bidor market. The market has now been demolished and so was the original store. He would sell fish ball noodles in the morning and subsequently beef noodles (soup based) in the afternoon. The latter was a success as he was the only one in Bidor town selling beef noodles. He learn how to make beef noodles by observing traders in Ipoh and trying it at home. Dad used to run to the market to get beef for him. Eventually he found that noodles making is time consuming. He then invented a machine to make the noodles. It was after the war and there were many abandoned vehicles around. He found an used lorry engine to work his machine. It was a huge breakthrough back then. I was told that when the Japanese came during the war, his life didn’t change much. In fact, he continued selling noodles. Food shortage during the war wasn’t a problem for him because of his profession. I guess he didn’t even realise that the war ended. During the last few days of the war, he suddenly had a surge of customers. He later realise that he had a surge of customers because people were trying to dispose the “banana money” (Japanese currencies) – which became worthless after the war. Grandpa had two wives and eight children – a norm during those days. Dad was the oldest of all the siblings. From selling noodles at the stall, his business pivoted into wholesale noodles business. It became a thriving business for many years. It expanded into other small towns. They engaged bus drivers to deliver the noodles and collect payment for them. However, it became a problem when customers said they paid the driver and the driver denied receiving the payment. Unfortunately (or rather fortunately otherwise I won’t be here), Dad and his siblings were not interested in taking over the business and subsequently the wholesale noodles business closed but the stall remained. My fourth uncle runs the shop now and one of my aunt still sells the fish balls noodles. Her fish ball noodles is known to be one of the best in Bidor. Unfortunately, no one took over the beef noodles business. Interestingly, fourth uncle’s son started a retail outlet selling biscuits and snacks in Ipoh using the same trade name “馮廣記”. We buried Grandpa, in his western suit which he requested, on a hill in Bidor. Being 103 years old, there is nothing to be sad about but rather a celebration of his life. Dim sum was enough to fill our stomach throughout lunch. We settled for light meals such as tau fu fah at Funny Mountain and white coffee at Nam Heong. Funny mountain tau fu fah also had a long queue. We had to line up under the sun to get it. Nevertheless is well worth it as it was smooth. There are no proper seats for patrons. Only benches and chairs. Being chubby and 126cm and 26kgs certainly didn’t help. Not to mention I was not academically smart. I bet my parents were worried sick to have such a poor performing child. However, I was fortunate to have a group of friends who were very active in sports. Peer pressure helped me to be involved in sports and subsequently develop my physical ability. My high school and post high school days were filled fun activity. Football and basketball were my favourite sports during high school. We played football in the evening at a park and in middle of the night at car parks (illegally). We also sneaked into condominium swimming pools and swam in our undies. Awesome memories! We even got our own jerseys with names printed on it. Then during university days, I spent most of my time playing basketball and going for Muay Thai classes. My housemates at a basketball court in Sheffield. We used to walk a few kilometers to this court. Now I’ve reach the big 3-0. My body is no longer as durable as before. An injury can take me months to heal. Back in the days, I could just sleep it off. Notwithstanding the big 3-0, my weekends are still reserved for my sporting activities. Saturday is jogging day. Sunday is rock climbing day. Monday is futsal day! All these sporting activities helped my health tremendously. I hardly fall sick. I’m no longer 126cm! If it’s not for sports, I may be as tall as fourfeetnine. And another thing, sports brought me many friends. Many of friends actually originate from my sporting activities. I wish I had taken many photos of all the sporting activities and friends back then. Looking at the old pictures while drafting this post brought back a lot of memories. There were friends long forgotten especially friends from the Muay Thai club. Learning from this experience, I suggest everyone to take pictures of their sporting activities and friends whenever they can. Those precious memories should be cherished! You can tune in to 1 Sihat Malaysia to get health tips on eating habits and healthy living, hosted by Fahrin Ahmad and features stories from the local celebrities. Posted on December 22, 2011 December 22, 2011 Author xesCategories GeneralTags 1 Sihat Malaysia, Fahrin Ahmad, gayahidupsihatLeave a comment on Aktif Setiap Hari! We started Day 2 with dim sum at Foh San. Foh San was crazy. It was packed with people! There is no proper system for people to get a table. We couldn’t get a table for half an hour. We only got a table after standing by the side of a table waiting for the people sitting there to leave. And we’re not the only ones doing it! I wonder what’s so good about this place. It’s self service and hence you need to line up to get your food. Most of the time, the good stuff have been snapped. Siew mai is abundant though. Nevertheless, food is still good but I don’t think it’s worth the hassle of lining up and fighting for seats. Sometimes you just feel like punching the guy who sits there reading newspaper. I stopped by Poh Wong Thong for some herbal tea. I was feeling “heaty” from the excessive food and fried stuff and slight flu. Poh Wong Thong is a small herbal stall. I told the boss that I’m about to have sore throat and flu. He gave me some sort of dark concoction to drink. It was rather bland. Fortunately, not bitter. I was given this sweet after my drink. I felt better in no time! It works! KF’s mum highly recommended that we have dinner at Xin Kuala Sepetang Seafood Restaurant located at Kuala Sepetang (formerly known as Port Weld), a small fishing village 60KM away from Ipoh City. Thank god for GPS, we managed to maneuver through narrow kampung and village roads. Kuala Sepetang is formerly known as Port Weld. This part of Kuala Sepetang is a small tranquil Chinese fisherman village. It’s amazing to see Chinese villagers staying deep inside Malay villages. According to my Dad, this place was the hot bed for Chinese gangsterism during the hay days of tin mining. Gang wars were frequent here. There are two well known seafood restaurants in Kuala Sepetang. We chose Xin Kuala Sepetang Seafood restaurant because apparently the locals prefer Xin. As soon as we arrived, we were greeted with loud continuous chirping sound of swiftlets. Bird nest farming is a thriving industry here. There is no proper entrance to Xin but a small alley to the restaurant. Fat people would to use a different entrance. The restaurant is build on wooden planks next to a river. It is surrounded by docked fisherman’ boats and mangrove trees. The best time to be at Xin is during sunset. The sight of the river, estuary, fisherman boats and mangrove trees was picture perfect! To order dishes, we need to choose our meals over a counter. Fishes were displayed on the counter for people to choose. Loads of flies were flying around. Some seafood is limited hence be early. We ordered steamed fish, chiew chau style fish, fried mini crab, tomyam soup and a few other dishes. I must say that their fishes were fresh and delicious! Tom yam soup on the other hand wasn’t spicy but sour. As soon as the sun sets, insects came out to play. They were sticking all over our clothes and hair. Overall, the bill came up to RM210 for 8 people. It was slightly pricey due to the fishes we ordered. The shops were all closed when we left around 9pm. Strangely, saloons were open. I guess small town folks have nothing to do but have their hair done at night. Most of them seem to be contended with life. Corruption and crime may be scarce here. This is probably why it is very difficult for Pakatan Rakyat to get them to vote for them. Yuna, a Malaysian singer songwriter, is one of the many talents discovered over the social media. She was discovered through Myspace and subsequently signed up by a US record label. If you’ve listen to her song but never seen her face before, you’ll be surprise. You probably think that the artist is America. But in fact, Yuna is a tudong clad Malay girl. My favourite song of Yuna is Come As You Are. It gives me goose bumps! Kurt Cobain would be proud! Other than English songs, Yuna is also well known for her Malay songs. Her song “Penakut” recently won the best song in the Anugerah Industri Muzik (AIM) 2011 but was revoked because of a mistake in the vote count. Doh. Yuna is now back in the limelight with another news. Although Yuna now lives in the United States, she will be collaborating with Hotlink to bring Malaysia a concert. Her first online concert! How does an online concert work? Well, it’s fairly simple. You first need to be a Maxis subscriber and then pre-book a spot at the Hotlink’s People Powered Concert. The registration can be done at the website www.nowyoucan.my/yuna where only 10,000 spots are available. The concert, to be held on 14 December will be streamed live on the website at exactly 8pm. Pre-booked viewers will have to logon between 7pm and 7.59pm to experience the exclusive viewing. She will only sing when the 10,000 people signs up for the event! People please sign up! What you should get for your girlfriend for Christmas! 1. Save money on SMS. With Whatapps, emails and other instant communication programs, you no longer need to text her. 2. Track her whereabouts. Install Foursquare on her phone and teach her how to use it. Once she’s addicted, you don’t need to worry when she is not picking up the phone. Oh, teach her how to avoid stalkers too. 3. Keep her busy. With internet connection and games, you can keep her busy while you’re having a beer with your buddies or watching the game. This would lessen requests such as “I WANT TO GO HOME NAO! !”, ‘I’m bored” or “Your friends stink”. Smurfs’ Village seems to be ladies’ favourite. 4. Keep her safe. Install the MyDistress App for her. This App allows user to connect directly to Polis Diraja Malaysia Selangor Contingent. If she has no opportunity to call the police, just get her to click on that button. And it works! 5. Good quality pictures. Most Smartphones come with good quality camera. Here you can get your other half to send you naughty nice decent pictures. And some pictures of her hot friends too….who you would like to introduce to your buddies. 6. Get brownie points. She will love you big time. Nuff’ said. 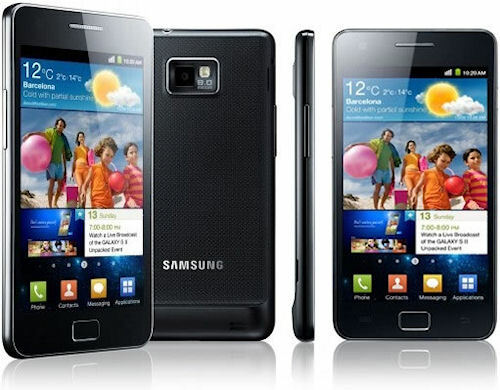 If you’re wondering which Smartphone to get, get the Samsung Galaxy SII. You have probably read my earlier review of Samsung Galaxy SII. Many of the extra features of this phone are highlighted at the I Love Samsung Website. Like many other smartphone, this gadget can connect to a CCTV system. You can keep your family safe to see the vicinity of your home through your CCTV system. It’s also useful for makeup apparently..
With 8.49mm thin and feather-light weight of 116g, this device is perfect for your lady’s handbag. If your lady’s handbag gets snatched, just activate the auto destruct command to blast the thief into pieces. And it is only RM1,899 (cheaper than buying her a LV Bag and Tiffany & Co accessories)! Check out I Love Samsung Website for more features! Posted on December 4, 2011 December 5, 2011 Author xesCategories GeneralTags Samsung, Samsung Galaxy SII, Samsung Galaxy SII features, Samsung Galaxy SII Malaysia7 Comments on What you should get for your girlfriend for Christmas! To those waiting to get your hands on the new iPhone 4S to play with Siri, don’t need to wait so long. Speech recognition technology has been around for quite some time but brilliant marketing by Apple makes it looks like it’s Steve Job’s gift to the world before his death. The speech recognition feature in this phone is better than Siri. It recognizes Asian accents! This phone is also more durable than iPhone 4S. Hen’s iPhone had a great fall. With sheer brilliance, he salvaged the phone by putting a piece of screen protector to that the broken glass doesn’t stick to his face when he uses up the phone. SALUTE! Another reason why I considered this phone is because their battery is removable. iPhone doesn’t allow users to remove their battery . Smartphones’ batteries nowadays doesn’t last long and they usually drain by the end of the day. Carrying an extra battery helps a lot. Wondering which phone I’m talking about? Well, the phone is no other than the Samsung Galaxy SII. I’ve been wanting to get the Samsung Galaxy SII. Now with Samsung Galaxy Note in the market..Aiyoh..Need to do more research. While browsing through the videos submitted at I Love Samsung Galaxy SII Website, I saw a lawyer’s video posted there. I know him cause I’ve done matters with him before. Very nice and jolly chap! Anyway, the part doing research in Court is pretty true. If you have an eLibrary with Dropbox enabled, that would even be more awesome. I’ll be speaking on the Use of Technology by Lawyers at the Bar Council on 6 December 2011. Do attend if you would like to know something about legal practice eDocumentation, eLibrary, Dropbox and so on. Click here for the flyer. Going back to the I Love Samsung Galaxy SII Website, it’s a user generated content website consisting of videos of users of the Samsung Galaxy SII. Do check them out!